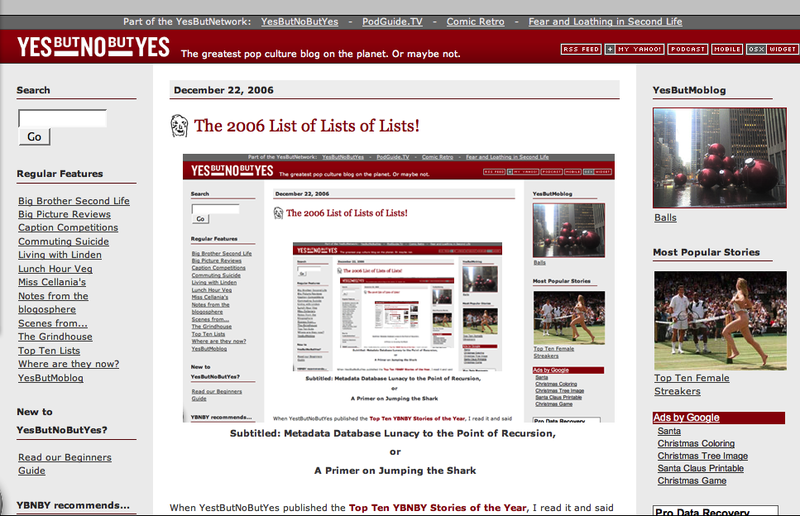 YesButNoButYes: The 2006 List of Lists of Lists! The 2006 List of Lists of Lists! Posted by Miss Cellania on January 01, 2007. Subtitled: Metadata Database Lunacy to the point of Recursion. The internet thrives on lists. Name it, and it’s on someone’s list of something. I found myself doing a list of lists for the end of 2006. The problem was not finding the lists, it was trimming the list of lists down to a managable level. The easiest way to do that is to list the top ten lists of lists. Here, somewhere, you will find out anything you want to know about the year 2006. 10. The list of 2006 lists at Miss Cellania. This inclusion confirms my reputation for shameless self-promotion. No particular subject, no particular order, and no ambition to be inclusive. In fact, its pretty much a mess of possibly entertaining links. At least its FREE! Bonus: includes a TIME Person of the Year widget for your site. 9. Top Ten YBNBY Stories of the Year, containing the best Top Ten Lists (and, to be honest, some other stuff). The list that inspired me to list lists. And if I didn’t include it, I could be fired. No, really, the best material is in this one. Really! 8. 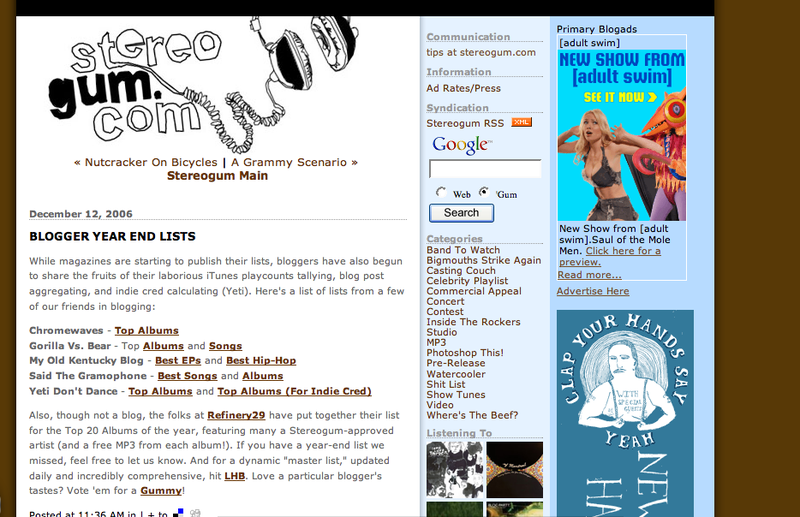 Stereo Gum lists the lists of their friends, mostly to do with the music of 2006. Whenever I’m plugging my friends, I don’t call them friends; I call them “experts” or “multi-talented” or something that sounds worth reading. I never subscribed to that silly honesty-in-blogging idea. Refers to #5 of this list. 7. 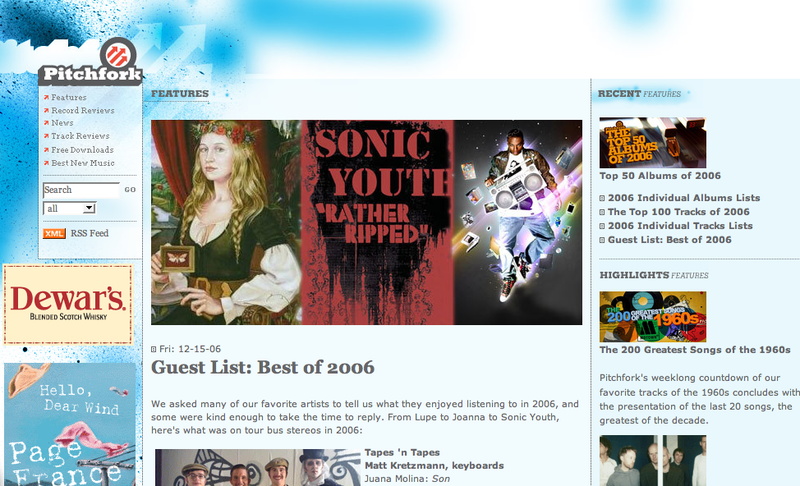 Pitchfork Media has a whole slew of lists of favorite music videos of 2006 contributed by musical artists. Because nothing strokes an artist’s ego like asking them to make a list. 6. 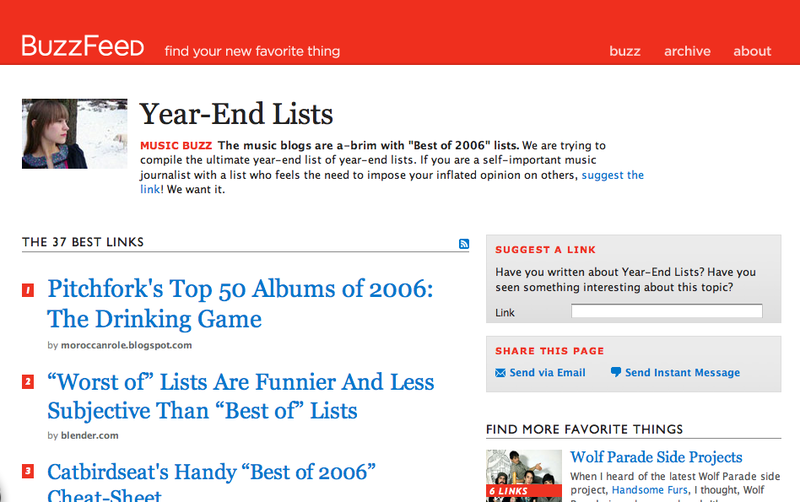 BuzzFeed is trying to stay ahead of the curve by listing year-end lists. Quote: “We are trying to compile the ultimate year-end list of year-end lists.” Ha! They ain’t got nothin' on THIS list! The opening blurb says this is a list of music lists, but there are also lists of videos, vlogs, and meta-lists. This list contains #7, #5, and #3 of this list. 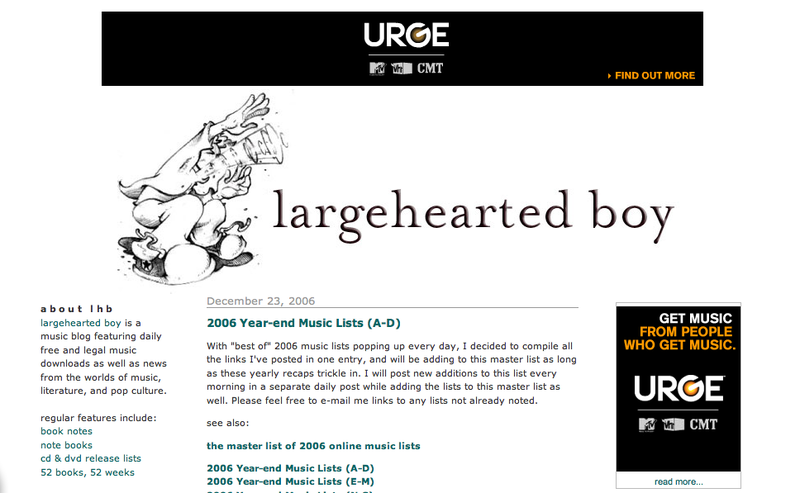 Best list titles: Year-End Lists Cause Wasted Energy Due to Endless Music Nerd Nitpicking And Groaning, Music Snob Enjoys Making Year-End Lists And Then Re-Editing to Death, and Another List, But You Probably Don't Care. 5. Large-Hearted Boy has compiled a list of year-end lists involving music. There are so many lists, he had to publish it in four parts! Refers to all other music lists in this list. This is candy for any music lover or anyone who suffers from Obsessive-Compulsive Disorder. 4. 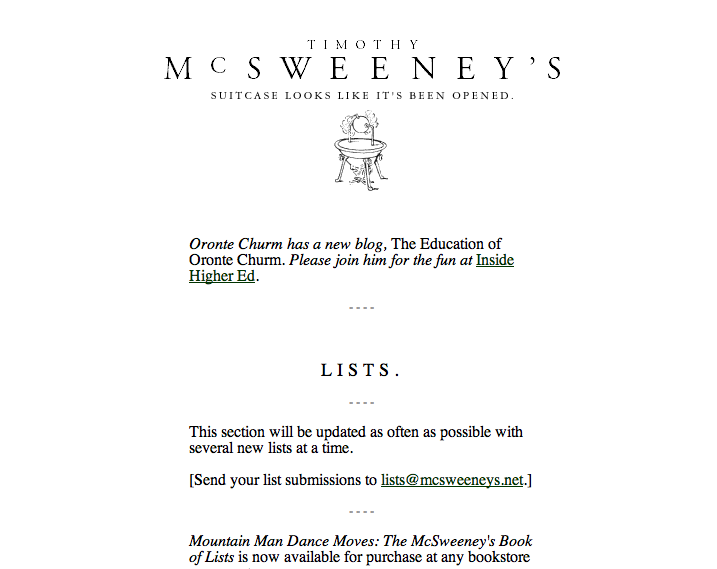 McSweeney’s List of Lists is constantly growing. From Vegetarian Alternatives to Bowling to Diseases I'm Glad Aren't Sexually Transmitted, these lists from around the internet are tres entertaining. Only the first few dozen are from 2006, but who cares, its McSweeney’s! 3. The Fimoculous List lists the lists of 2006. There’s a lot of them, covering all subjects. Refers to #1 and probably some others, its too damn big for me to sift through. Although I did learn that Jessica Alba’s pajamas were sold on eBay in 2006. 2. 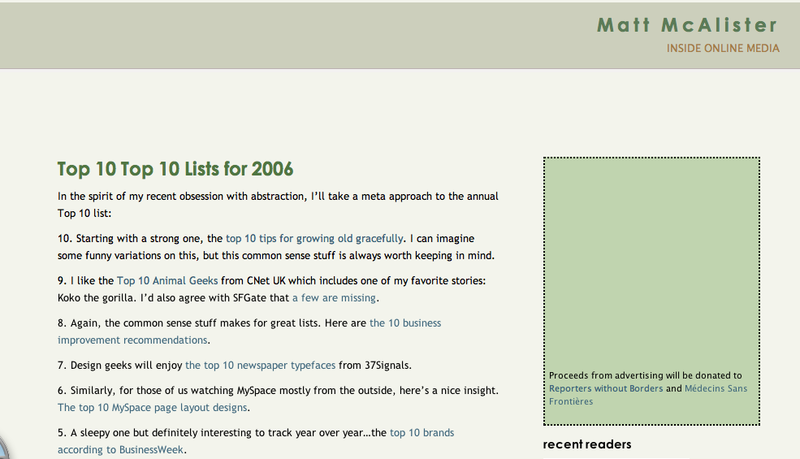 Top 10 Top 10 Lists for 2006, from Matt McAlister. This meta-list is part of his “recent obsession with abstraction,” which I completely understand. Best list: Top 10 Rules for Top 10 Lists. I think I’ve violated all ten of those rules right here. 1. 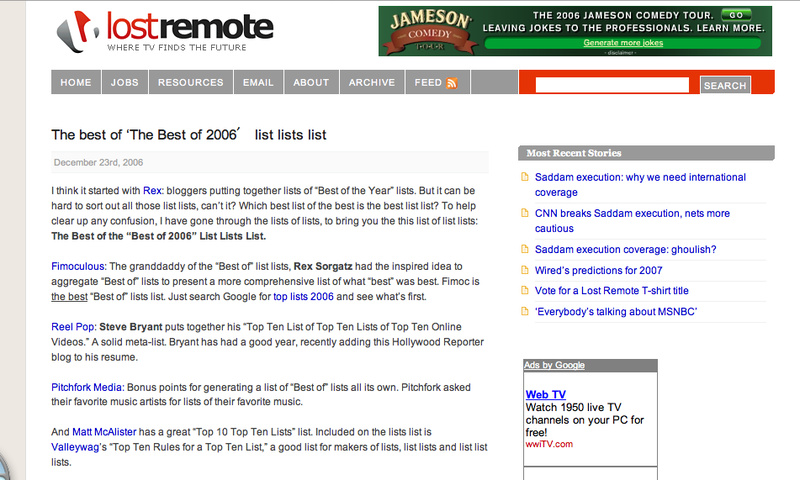 The best of ‘The Best of 2006 list lists list, from Lost Remote. Refers to #2, #3, and #7, and there was another list with a broken link. Aha! I have listed a list of the best lists of lists. And its on my list! NOW, lets see if any of these lists will list THIS list. In addition to several rings of recursion we already have here (especially those music lists; its almost incestuous), that would be the ultimate in recursion. Having said that, I probably won’t be writing any more lists for a while. You can relax now. If you enjoyed this story, read more like it in our Miss Cellania's section.